A nanny outside the Park Slope public library. 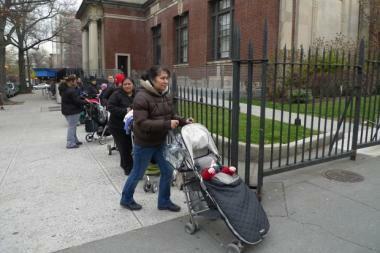 A 2013 survey by Park Slope Parents found that nannies earn an average of $15.79 an hour. PARK SLOPE — Nannies are getting paid better than ever, but most don't earn overtime and many are paid off the books, according to a new survey by Park Slope Parents. Nannies now earn an average of $15.79 an hour, according to the survey of 750 parents, 57 percent of whom live in Park Slope. That's a 90-cent increase from 2011, when the last survey was conducted. Most caregivers get annual raises, paid time off — an average of 13.5 days — and holiday bonuses. But the majority are paid off the books, and work overtime without receiving the legally required time-and-a-half increase, the survey found. That means most nannies wouldn't be eligible for unemployment benefits if their jobs ended, and couldn't receive worker's compensation if they were injured on the job. "It's a tricky situation," Park Slope Parents founder Susan Fox said in a statement. "Paying on the books can be costly, and some nannies ask to be paid off the books to retain social welfare benefits they would otherwise lose." She added, "The lack of other affordable childcare alternatives also leads parents to cut corners, and needing a job causes nannies to want the immediate cash that off the books pay gives them."